Craven Thirty, the planned mixed-use community off N.C. 43 and U.S. 70, has taken on a new name, and possibly a new lease on life. The project, which was touted by former Gov. Bev Perdue in 2012 and then stalled by an economic slump and a changing retail landscape, has been renamed West New Bern. The site is now planned as a primarily residential development. 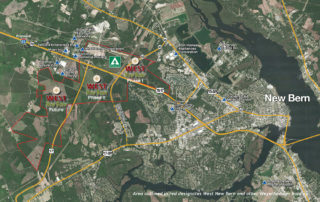 According to a West New Bern website launched Tuesday by Weyerhaeuser, the company designing the site, Phase 1 of the project spans approximately 540 acres and will include residence capacity of approximately 1,500.